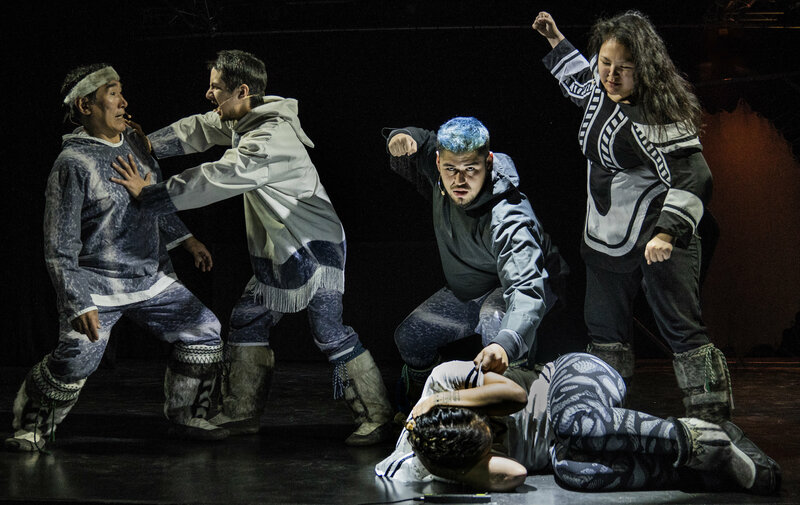 No need for any of the rough stuff in the Tarragon Theatre presentation of Kiviuq Returns where Unuit culture has come ashore with remarkable song, storytelling, and poetry to showcase the talents of our brethren of the North. One of the most underrated priviledges of life in this cultural mosaic we know as Canada is the never ending source of storytelling taking various shapes and forms in homage of the present as well as the past. Let the rest of the world construct their walls, fences and ethic divide they perceive to be solutions, here in True North Strong and Free we got it pretty darn good despite the corrective steps we still need to tackle together as a nation. This is the impression one’s left with after experiencing Kiviuq Returns: An Inuit Epic. Conventional theatre that we’re accustomed to, this is not. A celebration of a people, language and customs it most definitely is. To have such a spectacular and stirring event to the scale it represents, is a cultural blessing in disguise. The title refers to legends derived from an iconic hero figure as passed down from communal elders throughout the years and re-enacted by six enthusiastic cast members tasked with sharing these tales to those who have never had the opportunity of Indigenous immersion in an Arctic landscape comprised of approximately 65,000 people. Beyond the dazzling projection arrangement to illustrate real life imagery of existence close to the Pole, both the attire chosen for this artistic gathering and sometimes entrancing movement moments is spellbinding to say the least. The combined effects create a unique atmosphere where the spoken word need not interfere with prevailing mood. A pleasant place for all in its delivery warmth and humour, Kiviuq Returns and its varied components is hands down the way a salute to our nations diversity that enriches us all.